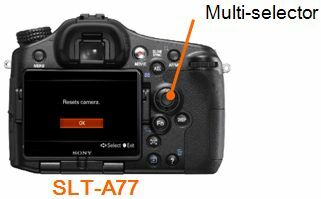 Sony is offering a firmware upgrade program for Interchangeable Lens Digital Camera SLT-A77. SAL100M28, SAL50M28, SAL85F28, SAL18200, SAL20F28, SAL28F28. 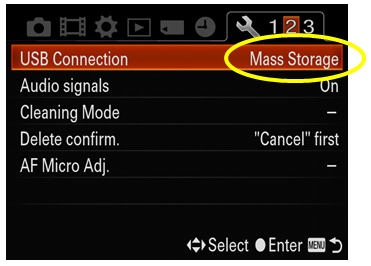 Addition of capability to enable or disable MOVIE button. Improvement of response for Auto review. Improvement of response for front dial and rear dial. Improvement of response between power SW operation and power off. Improvement of AF response with 500mm F4 G SSM (SAL500F40G). Improvement of AF accuracy for the scene including of light part. 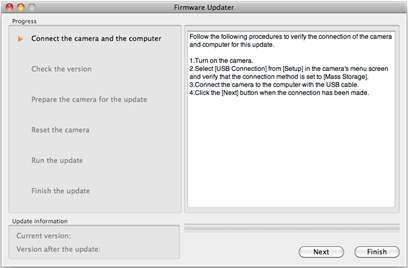 The applicable products are with the firmware Version 1.06 or earlier. 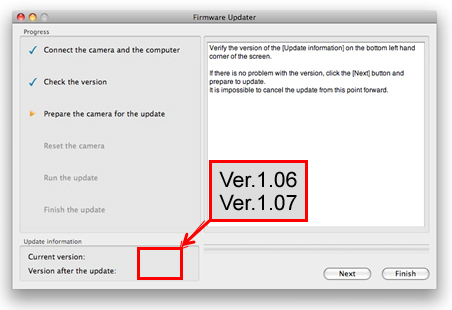 If your camera firmware version is already Version 1.07, this update is not necessary. Mac OS X® v.10.5 – 10.11. For SLT-A77, the registered value of AF Micro Adj. is reset by this firmware update. Click on Update_SLTA77V107.dmg to begin download. Double-click the downloaded file Update_SLTA77V107.dmg for SLT-A77. 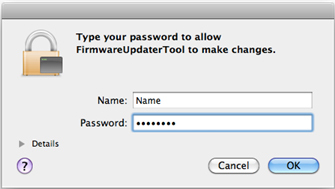 This screen appears on Firmware Updater. 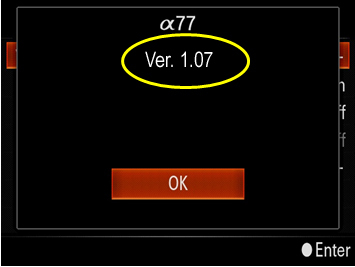 Note: If Current version is Ver.1.07, the upgrade is not required. According to the message, stop the USB connection and click Finish. Turn off the camera, remove the battery pack or the AC adaptor, and then turn on the camera again. 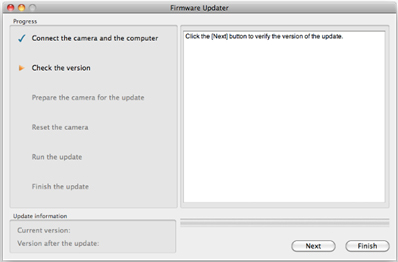 The firmware version is displayed. The firmware upgrade was completed successfully if Ver.1.07 is displayed.